Daniel Beck is civil litigation counsel for the United States Attorney’s Office. He received his Juris Doctorate degree from Yale Law School, where his research interests concentrated on religious law in Antiquity. Over the years his interests have transitioned to Qur’ānic studies. Critical scholarship on the Qur’ān and early Islam has neglected the enigmatic earliest surahs. Advocating a more evolutionary analytical method, this book argues that the basal surahs are logical, clear, and intelligible compositions. The analysis systematically elucidates the apocalyptic context of the Qur’ān’s most archaic layers. Decisive new explanations are given for classic problems such as what the surah of the elephant means, why an anonymous man is said to frown and turn away from a blind man, why the prophet is summoned as one who wraps or cloaks himself, and what the surah of the qadr refers to. Grounded in contemporary context, the analysis avoids reducing these innovative recitations to Islamic, Jewish, or Christian models. 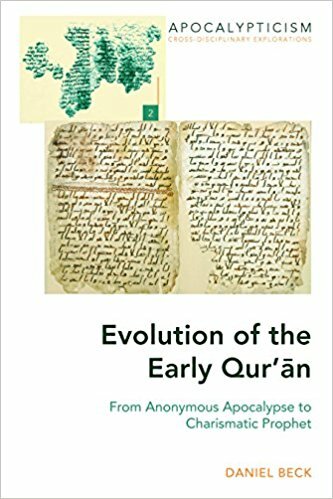 By capitalizing on recent advances in fields such as Arabian epigraphy, historical linguistics, Manichaean studies, and Sasanian history, a very different picture of the early quranic milieu emerges. This picture challenges prevailing critical and traditional models alike. Against the view that quranic revelation was a protracted process, the analysis suggests a more compressed timeframe, in which Mecca played relatively little role. The analysis further demonstrates that the earliest surahs were already intimately connected to the progression of the era’s cataclysmic Byzantine-Sasanian war. All scholars interested in the Qur’ān, early Islam, late antique history, and the apocalyptic genre will be interested in the book’s dynamic new approach to resolving intractable problems in these areas. Preface – Acknowledgments – Maccabees Not Mecca : The Biblical Subtext and the Apocalyptic Context of Sūrat al-Fīl (Q 105) – Al-Ṣamad of Sūrat al-Iḫlāṣ (Q 112) – On the Genealogy of the Rasūl Function : From Eschatological Descent of the Astral Messenger to the Devotional Ascent of the Earthly Messenger – Sūrat al-Qadr (Q 97) : Celebrating the Celestial Savior’s Descent and Refuting Christian Communal Ritual – Opening and Pouring-Out the Warner : Sūrat al-Šarḥ (Q 94) and the Construction of Quranic Prophetology – A Servant Wrapped in Glory : The Counter-Baptism of Sūrat al-Muddaṯṯir and Sūrat al-Muzzammil (Q 73 and 74) – Postface—Chronology and Geography – Works Cited – Index.